*Werbung / Advertising! This post was created in cooperation and financial support with Visa. Those, who follow me on Instagram already know, that I recently was in New York. 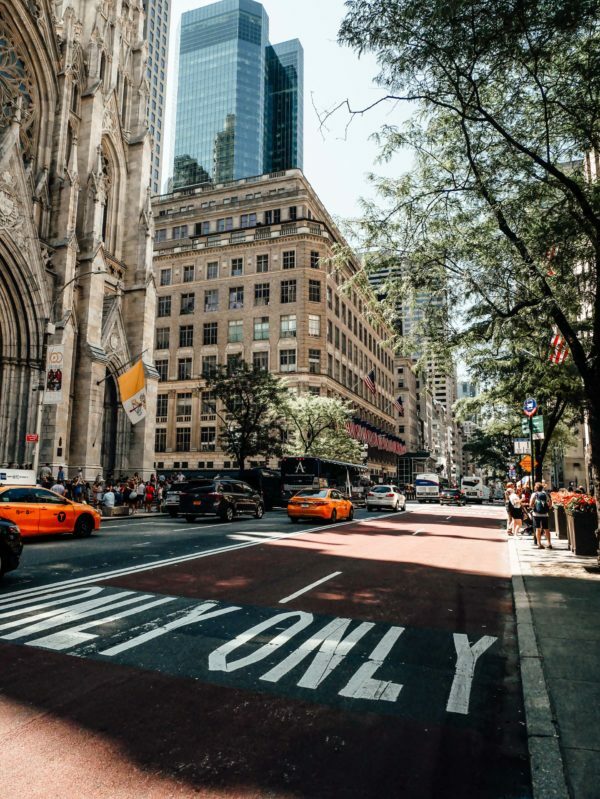 I travelled to this amazing city in cooperation with Visa to put together a little NYC travel guide for you guys. 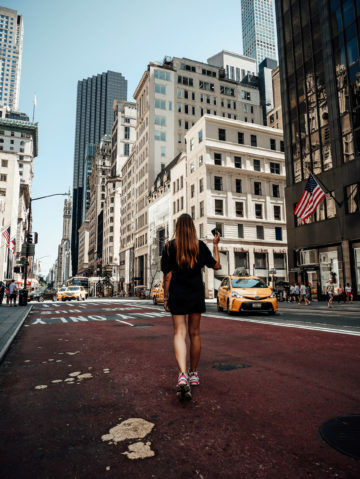 But it’s not just an ordinary travel guide; I tested for you how easy it is to do things in New York without using cash. So all I had with me was my Visa credit card, no cash and nothing else. A small fact before I start sharing my tips: my first time in New York was about ten years ago, and I got my very first Visa card for this trip. Since then, I can not go on vacation without my Visa card, because I find it incredibly impractical to walk around with foreign currency and a lot of cash in my pocket. And every time you are using cash of foreign currency, you bring some of it back home. Money, you can’t use once you are back home and let’s be honest, who goes to a bank to exchange the money back again? If it’s not that much, we don’t, do we? And even if we would do it, we probably would lose money because of a changed exchange rate. 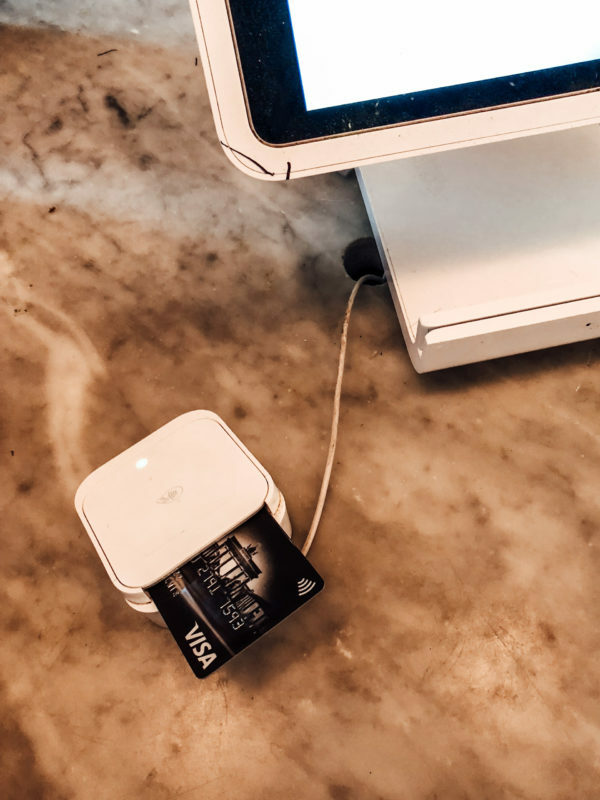 You don’t have this problem with a Visa card, because everything runs smoothly without cash and you have an overview of all expenses on your account statement, so theoretically you do not even have to collect all your checks. Regarding the exchange rate, for the Visa card, the bank rate of the time of the booking is the one that counts. Meaning, that they will book the amount you spent on your currency with the exchange rate of the time the payment was booked. Okay, this might sound complicated, but it’s actually quite simple. Another advantage of the Visa card is that you can buy a lot of things such as tickets for museums, shows etc. in advance and thus often saves money and time. But I will tell you more about this in the following. 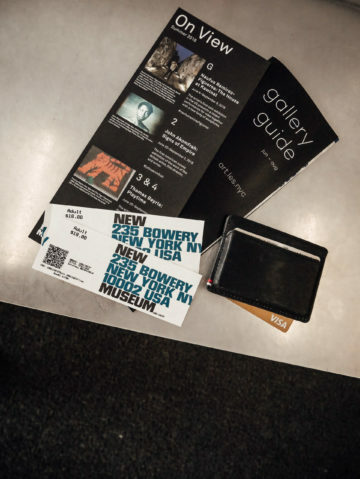 In the following, you can now find my NYC travel guide with things you can do cashless using only your Visa card. 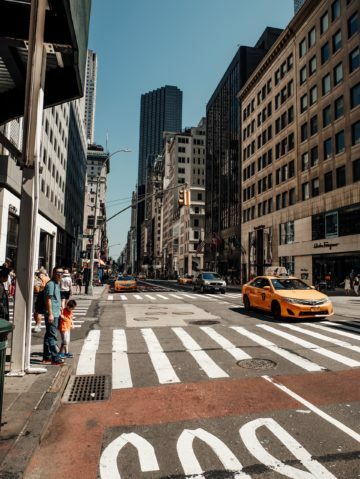 You asked me for some restaurant recommendations, shopping tips and a few of my highlights and, of course, I included them in my travel guide for New York. For all the tips I am sharing in the following, you can use a Visa card, and you won’t need any cash. But I actually never experienced, that it is not possible to pay with Visa. I even bought a postcard and paid for it with my Visa. 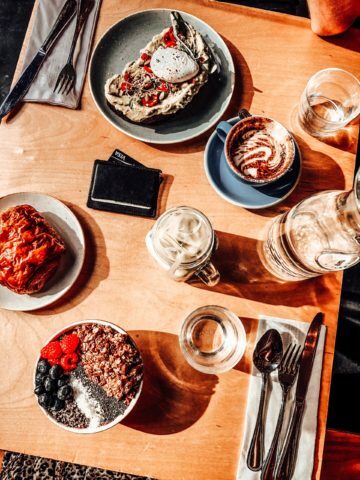 For breakfast and brunch, I can recommend the Pause Café, Two Hands and Citizens of Chelsea. All three cafés have a great selection of sweet and savoury dishes, and many of them are designed for a balanced and healthy diet. My absolute favourite was the Pause Café as it was unexpectedly good. 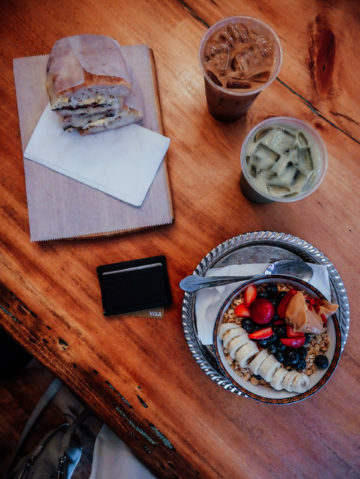 It’s located in East Village, and the Acai Bowl and Matcha Latte were delicious. 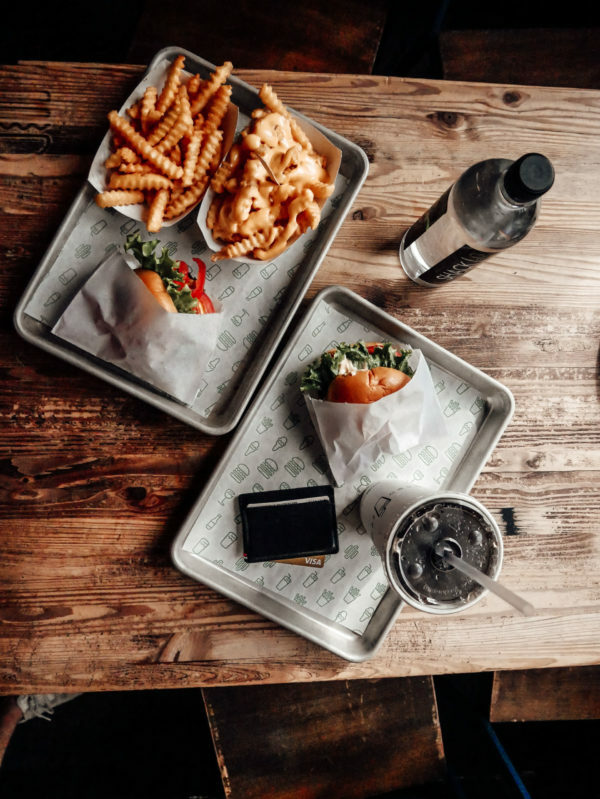 The following restaurants are partly also suitable for breakfast, but even better for lunch and dinner. For lunch, I would definitely recommend Katz’s and Café Select. 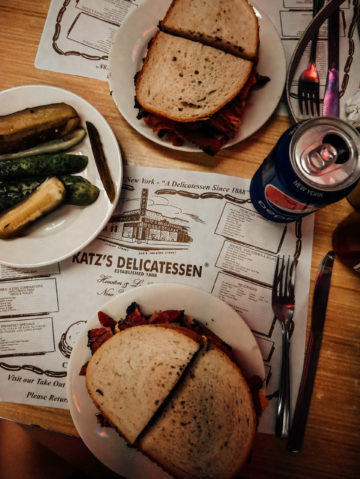 Katz’s delicatessen is known for pastrami sandwiches, and you may have heard of it before. I would recommend to go there during the week and not necessarily during peak times, because otherwise, you may have to wait for at least an hour to get a seat. But the pastrami sandwich is definitely worth the wait; it’s delicious! If you are looking for a restaurant for dinner, you should visit BoCaphe, Banter or Rintintin. I also highly recommend Xian’s Famous Foods. But it hasn’t the best atmosphere. It’s not a place you spent a lot of time at, you just go there, have your meal and leave. The dumplings were once awarded as one of the best in NYC, and I can highly recommend them. I tried the vegetarian version and would have loved to order another portion; it was so delicious. 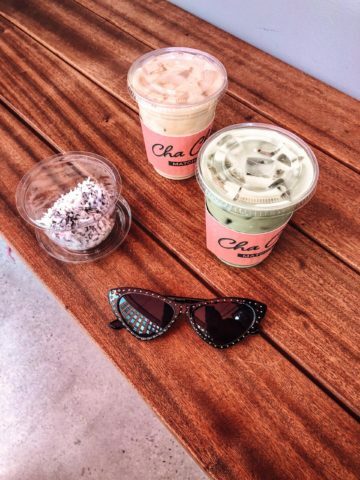 By the way, I drank the best matcha latte at Cha Cha Matcha. This is not necessarily an insider’s tip, but even as someone who normally avoids these kinds of hyped places, I have to say that the hype is not in vain. You can pay cashless with a Visa card in all restaurants named above. In New York, there are a variety of ways to get around: the subway, buses, taxis, Uber or even bikes. These are the most common ways of transportation in NYC, and we’ve been on the subway or used Uber most of the time. Uber is the best to get to or from the airport because it’s the easiest as the buses and trains are not really suitcase-friendly. Compared to taxis, Uber is less expensive in New York, and it can be easily ordered via an app. All you need to do is deposit a credit card, such as the Visa. But, of course, you should go by taxi at least once in New York. Hailing a cab as they do it in every movie playing in New York City definitely is a highlight. 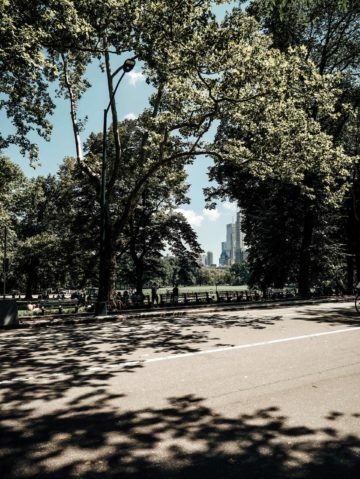 My personal highlight was the bike ride through Central Park. 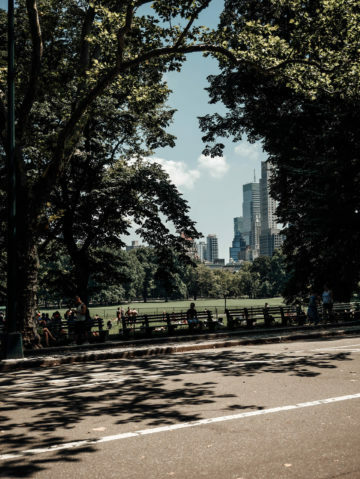 This is not just a tip for getting around, but also for activity, because you can spend hours in Central Park. We borrowed bikes from Bike Rental Central Park. Everywhere around the park, some people want to rent you bicycles, but we just searched online, found this website, selected our bikes and paid with Visa. The significant advantage here: it was much cheaper to buy it online as at Central Park. We saved 50 percent! New York is an incredibly big city that has so much to offer. It is always the best to walk through the streets of the city, but there are also some highlights you shouldn’t miss and stop by. NYC is known for its great museums, and you should visit at least one of them. 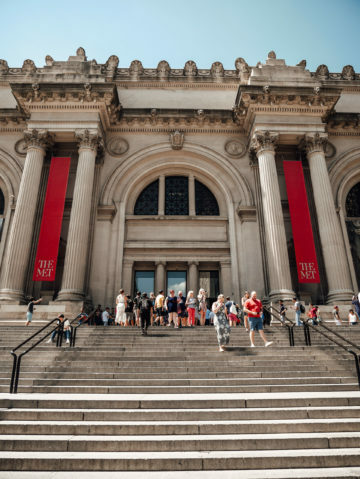 Some of the best-known museums are The Metropolitan Museum of Art, the Solomon R. Guggenheim Museum, the American Museum of Natural History and the Museum of Modern Art (MoMA). 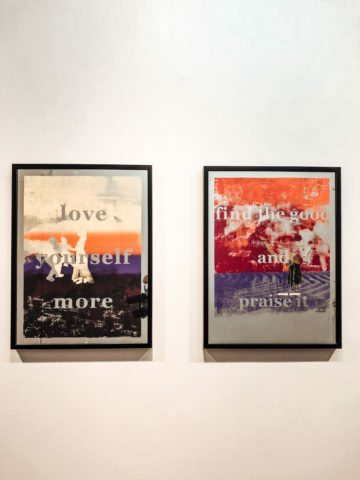 We decided to check some smaller museums and went to the New Museum of Contemporary Art on the Lower East Side. It has three main exhibition areas, a cinema, a café, smaller exhibition areas and a rooftop terrace. 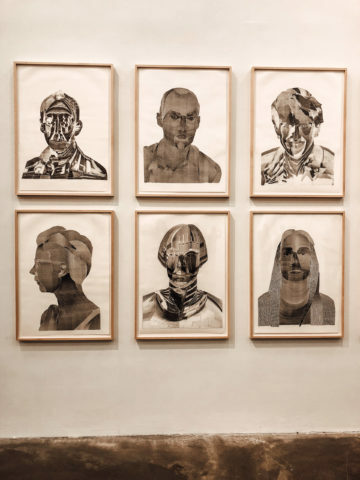 The museum focuses primarily on emerging artists who are important but often undervalued. 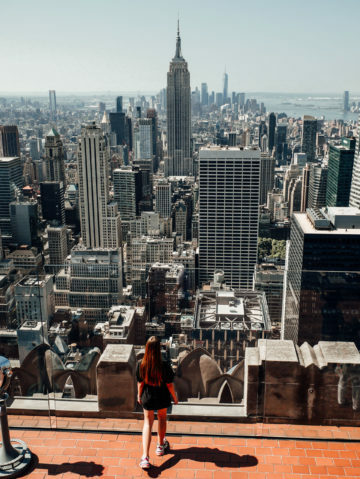 One more thing that should be part of every New York visit is to see the city from above. 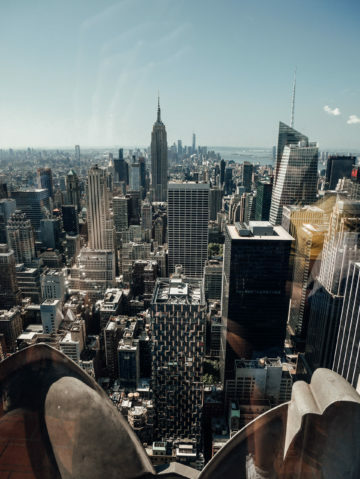 There are plenty of rooftop bars you could visit, but also the tallest buildings with their viewing platforms. 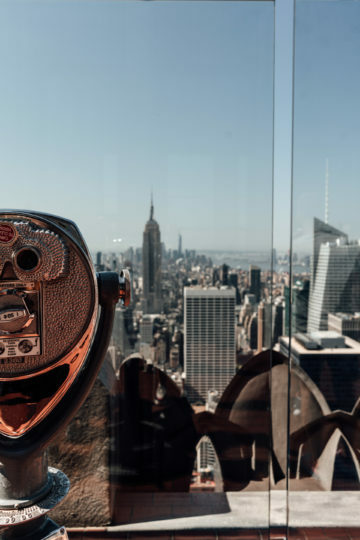 The two most famous are the Empire State Building and Top of the Rock from the Rockefeller Center. When I was in New York for the first time, I was on the Empire State Building, so this time I wanted to go to the Top of the Rock. The advantage here: you can see the Empire State Building, and you also have a slightly better view, because there are no grids just windows. I have to admit, $ 36 is quite a lot, but it’s definitely worth the view you get to enjoy. If you decide to go to Top of the Rock, I would suggest bringing your Visa card. If you pay with a Visa card, you can use one of the plenty machines, and you usually don’t have to queue up and can save some time. My last tip for activities is sports games. New York has some excellent teams in a variety of sports. If you’re from Germany, you probably will not want to watch a soccer game, but baseball, football and basketball are real NYC highlights. In all three sports, you have the choice between different clubs, so the chances are good that there will be a match while you are in town. The atmosphere at these sports games is fantastic and so different from what you might be used from Germany. It’s all about entertainment, and every sports game in the USA is a very special experience. I went to a Brooklyn Nets basketball game, and even though I’m not a fan of this sport, it was a lot of fun to watch the game and everything around. I still want to see a football game, that’s on my bucket list, but the season is just about to start. 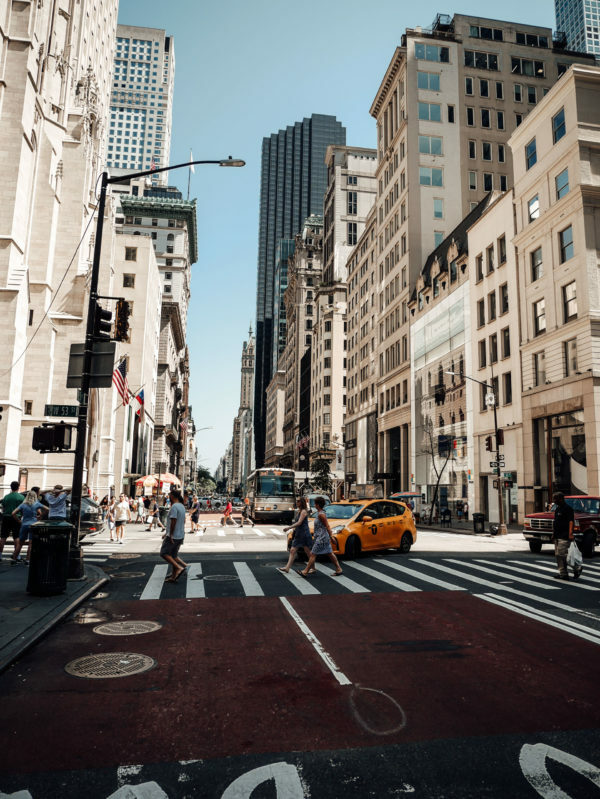 You can actually shop everywhere in New York because stores and boutiques can be found everywhere. But my favourites are 5th Avenue and Soho as well as East Village for vintage shopping. 5th Avenue just because it has everything to offer from low-budget to high-budget and I think you should have done some shopping there at least once. Of course, it is quite busy there, so if you don’t like it at all, you should try Soho. Soho get’s busy as well, but it’s much calmer and more relaxed than 5th Avenue. 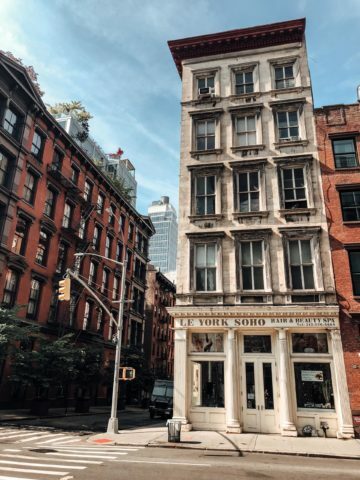 Soho also offers everything you can imagine, and in addition to this, you can find a lot of cute cafés, small boutiques, some great restaurants and vintage stores there. 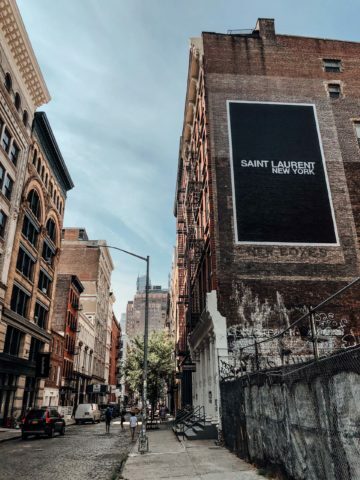 There are mainly luxury vintage stores, and if that’s something you are interested in, you should definitely check out The Real Real. And last but not least: East Village. The district is characterised mainly by the many vintage stores. Unlike Soho, however, the focus here is not on designers. In East Village, you will find Levi’s denim, leather jackets and vintage band shirts – to name a few examples. It’s best to spend a lot of time in East Village, check out all the vintage stores and I am sure, you will find a few bargains. Are the Beach Clubs in Bali worth a visit?